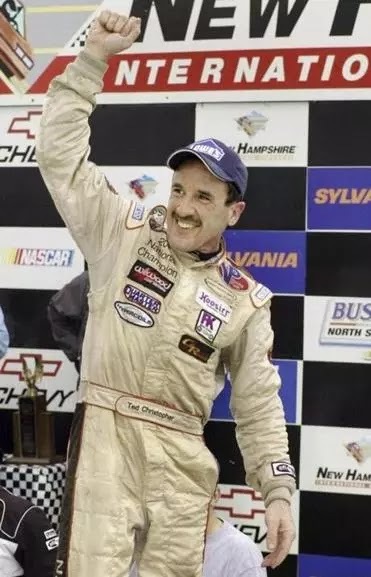 This article is dedicated to the life of NASCAR Whelen Modified Tour star Ted Christopher, who lost his life in a plane crash last Saturday. He was 59. This weekend’s venue, the New Hampshire Motor Speedway, saw many key moments in Christopher's career. In 54 modified starts there, he scored five victories, five poles, twenty-one Top Fives, and thirty Top Tens. He scored another five wins there in what is now the K&N Pro Series East, many times while running his iconic #13 LesCare Kitchens machine. With that success came a chance to compete in Truck, XFINITY, and Cup Series competition, which he did for a combined 29 starts over a decade. Incidentally, the Loudon track also saw his only last-place finishes: one each in XFINITY and Cup. The former, which came on May 9, 1998, was a first step that transitioned car owner Ted Marsh from K&N East to XFINITY, where he would also field cars for Steve Park and Dave Blaney in the early 2000s. The latter, which occurred on September 19, 2004, came driving for Stan Hover, who at the time was returning to the Cup ownership after several seasons away in ARCA. It was also Loudon that saw Christopher make his final start in NASCAR's top three series on September 17, 2006. That day, the driver finished 41st for crew chief turned car owner Kirk Shelmerdine. Our condolences to Christopher’s family, friends, and fans. As we reported on Twitter earlier this summer, car #07 has the fewest last-place finishes of any number in NASCAR Cup Series history (between the currently available 0 through 09). In fact, the #07 (along with the #86, which has 16 last-place finishes) stand as the only two numbers to have not finished last in NASCAR’s modern era (since 1972). Last week, we met Danny Byrd, who scored the number's first last-place finish in 1965. Today, we meet the only other driver to match him. On July 14, 1968, George Davis picked up the 1st last-place finish of his NASCAR Grand National Series career in the Northern 300 at the Trenton Speedway when his #07 Malco Auto 1966 Chevrolet had transmission issues on the opening lap of the 300-lap race. The finish came in Davis’ 25th series start. 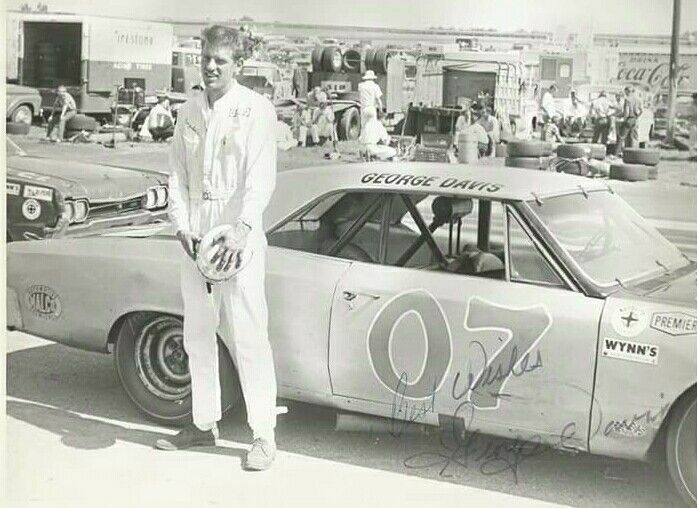 While Danny Byrd made his way into NASCAR through ARCA, George Davis’ entry came through the NASCAR Sportsman Series ranks, known today as the NASCAR XFINITY Series. One of Davis’ earliest recorded modified starts came at the Trenton International Speedway, the same “kidney bean” shaped five-turn doglegged oval that would see his lone NASCAR last-place finish. On August 22, 1965, Davis finished 8th of 30 drivers in a race won by Ray Hendrick (the same driver represented on Denny Hamlin’s “throwback” scheme at Darlington). He would go on to finish 8th again the following year at Atlanta. A veteran of the U.S. Army from Albany, New York, Davis made his Grand National debut on May 19, 1967 at the Beltsville (Maryland) Speedway, a half-mile paved track. Davis started his #07 Chevrolet 14th in the 16-car field and made his way to 10th, the last car under power, in an event won by Jim Paschal. Three starts later on June 10th, at Birmingham’s paved oval, he earned his first Top 10 with a 7th-place run, seven laps down to winner Bobby Allison. The 21-race schedule he ran that season was capped by his lone Top 5 at Savannah (Georgia) Speedway on August 25, where he finished 5th behind Richard Petty, Elmo Langley, “Tiger” Tom Pistone, and Neil “Soapy” Castles. Davis’ car also ran well when he wasn’t in it. On June 6, 1967, during the Macon 300 at the half-mile Middle Georgia Raceway, Davis handed the steering wheel to Bobby Allison. The leader of “The Alabama Gang” had to that point pieced together a strong start to the season with wins at Bowman Gray Stadium and Savannah, and arrived at Middle Georgia with a streak of six consecutive top-five finishes. When Cotton Owens, Allison’s team owner for much of that streak, didn’t have a car entered in the Macon 300, Davis had Allison climb aboard. The #07 turned in its best-ever finish with Davis as owner, running 4th, 10 laps down to Richard Petty. Allison would go on to finish 4th in the series championship, having raced for six different owners in that year alone. Coming into Trenton in 1968, Davis had made just three of the first 28 rounds of the season with no finishes better than a 17th at Beltsville, Maryland on May 17. Records indicate that he had, however, obtained sponsorship from Malco Auto at Rockingham the previous week, where a crash left him 35th after just 96 laps. It was perhaps due to this accident that Davis lined up 36th and last on the grid at Trenton, and the same reason he followed Bill Vanderhoff (driving Roy Tyner’s Chevrolet) to the garage on the very first lap. Behind Davis and Vanderhoff came 34th-place David Mote, who was making the seventh and final Grand National start of his career. Driving Ken Cline’s #69 Chevrolet, the 27-year-old had finished no better than 14th at Fonda the previous round, and this time was stopped by a broken sway bar. Incidentally, Mote was born in Siler City, North Carolina, the same hometown as Wayne Andrews, a fellow dirt tracker who raced against J.D. McDuffie before both were in NASCAR. Willowdale, Ontario driver Harold “Frog” Fagan finished 33rd, his 1966 Ford involved in a multi-car accident that also involved owner-driver Ed Negre, who rounded out the Bottom Five in his #8 1967 Ford. Davis would later move to Maryland, where he opened his own sheet metal business, Sheet Metal Unlimited, in Rockville. He was also active in many organizations, particularly in street rodding through the Good Guys Street Rod Association. He and his wife Anna raised two children and two grandchildren. Davis passed away on March 15, 2005 at age 66. On top of their last-place finishes, Danny Byrd and George Davis were also among the first drivers to run the #07 at all: Byrd was just the fourth driver to run it while Davis’ first NASCAR start was the number’s ninth. In the years ahead, #07 would build up an even longer streak as it had never won a Cup Series race. The number would go on to be driven by Coo Coo Marlin, Sterling’s father, into the early 1970s. Wendell Scott made one of his final starts with the number at Charlotte in 1971. Jeff McDuffie, J.D. McDuffie’s son, made three starts in the number at North Wilkesboro and Rockingham. The number flipped wildly during Randy LaJoie’s terrifying Twin 125 crash in 1984, made the inaugural Brickyard 400 with Geoff Brabham in 1994, and carried a shimmering mirror-like wrap under the Ultra Motorsports banner with Sirius Satellite Radio and Ted Musgrave in 2002. In 2005, Richard Childress Racing campaigned the number with new sponsor Jack Daniel’s, a reference to the liquor company’s “Old No. 7” branding. After a difficult season with Dave Blaney, Childress tabbed his Busch Series driver, Clint Bowyer, to make a bid for Rookie of the Year in the car in 2006. The following year, Bowyer and the number would be involved in another spectacular wreck at Daytona, sliding on its roof across the finish line in the Daytona 500. 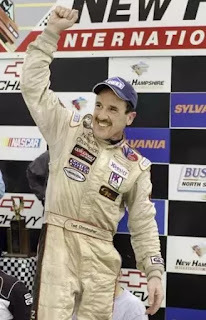 On September 16, 2007, ten years ago at the site of this weekend’s race, the New Hampshire Motor Speedway, Bowyer broke through by winning from the pole, leading 222 of 300 laps in the Sylvania 300 for his first Cup Series victory. It was a victory not only for Bowyer, but for all the drivers who raced the number before him, including the only two men who, to this day, hold a unique place in NASCAR history. Thank you sharing such a nice and informative post. This brought back so much memories of mine linked to this passion of mine of car racing.